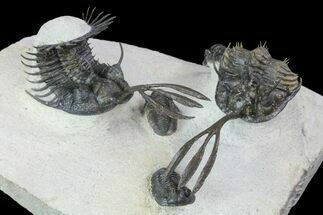 Walliserops is a very bizarre middle Devonian trilobite found in the Foum Zguid region of Morocco. It has a distinctive three pronged rostrum coming off the front of it's head and one can only speculate on what it's purpose may have served. 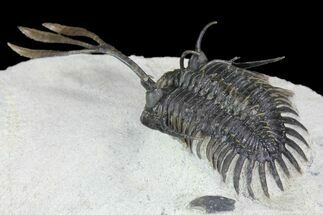 There are two species of Walliserops, Walliserops trifurcatus with a long rostrum approximately the same length as the body and the short formed Walliserops hammi. 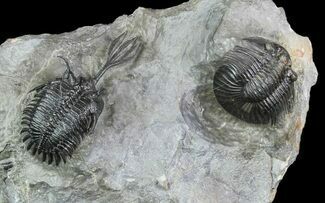 It takes more than 40 hours of work under microscope to prepare one of these trilobites including the dozens of free-standing spines.